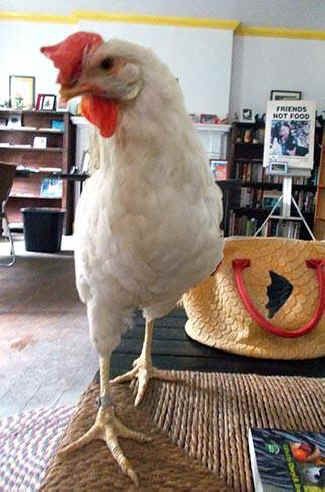 It's amazing to look at Miss Earth Angel, our brave little hen, and think about her life: Born in an industrial hatchery, badly debeaked and squeezed in a henitentiary with thousands of other hens, miraculously rescued and flown to Watkins Glen, New York, then driven 9 hours to United Poultry Concerns in Machipongo, Virginia in a van. On September 26, 2013, we adopted 50 hens from a California egg facility, saved by Animal Place, who flew more than a thousand of these hens in a private jet to sanctuaries on the East Coast. 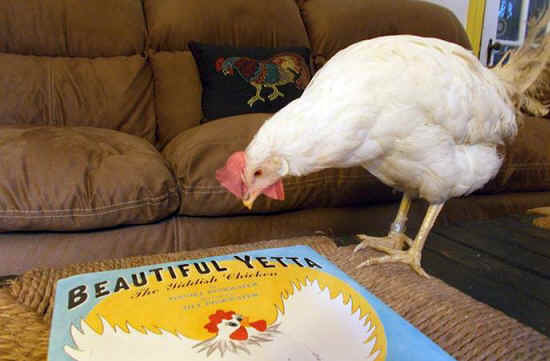 To learn more about these hens see Beautiful Hens Fly Home to United Poultry Concerns! Though some of the hens have since died, others are still with us, and one of them - Miss Earth Angel - has had 4 surgeries this year related to problems resulting from having been bred for excessive egg production. I knew the fourth surgery was especially risky, but the alternative was that she would die from the accumulation of egg debris in her system, so our veterinarian and I decided to give her another chance for recovery on November 14th. Unlike before, this time she did not rebound quickly from the operation but slept on her blanket in the kitchen most of the time. Sadly I assumed she would quietly die, but lo and behold, at the end of November, she rallied! And here she is today, December 29, 2015, trotting about the house, spending her afternoons on our screened-in porch with a little group of elderly chickens, hopping up to her perch in the kitchen each evening and jumping off it at 6:00am ready to begin her day and enjoy her spinach, her friends, her life. It’s great to be able to tell you about Miss Earth Angel and to thank you on behalf of her and all of us at United Poultry Concerns for your continuing support in the year ahead. Your donations support our sanctuary, including the excellent veterinary care our birds receive, and all of our programs and activities. And in case you missed our holiday fundraiser story of Felix and Gabby, here it is again about two of our dear chickens who comforted each other from the moment they met and why your support means so much to us.